I am stil using an iPhone X as I don’t feel that the iPhone XS or XR are different enough to the X, but both new lines are great for people who are on an older bezel phone (the ones with the black strips above and below the screens. The iPhone XS and XR are effectively the iPhone Pro range and are not for everyone, given that they come in at a higher price point to the normal iPhone 8 or 7. But if you are looking for a top-of-the-range iPhone, the XS and XR are superb. But the XS starts at €1179 whereas the XR comes in at €879, so it is definitely worth considering the XR and all of its comparable features. It is not a lesser iPhone, it just has a few minor omissions. The new iPad lineup seems to tick all boxes for me- I adore the iPad Pro and am typing this article on the new iPad Pro with Folio case. It is light, very very fast, and a gem to carry around. I’m trying to use this more frequently, over my MacBook Pro, as I like the multi-tasking and find I can do so much more on this device than on previous iPad models. But at the same time you can buy a standard 9.7” iPad for a very low price of €369 (32GB) or €459 (128GB) which is good for a device which originally launched in 2010 at $499. When you think about the advances in speed, screen quality, graphics and more in those 8 years, today’s iPad is quite the bargain. The iPad Pro starts at a much higher €909, but has a larger screen, Pencil 2 support, Folio case support and more. I am happy with my choice at a higher price, but the starter 9.7” iPad could be many people’s only computer, for €369. The changes to the Apple Watch in 2018 have been incremental, and I stil have a Series 2 version. The new Series 4 is likely to answer my major concern- speed. I will be getting a new Watch over Christmas as the combination of the speed changes and the slightly larger display (44mm) makes this a worthy upgrade for earlier Watch users. If you have a Series 3- wait. But for anyone with an earlier model, there is enough of a gap now to justify opening your wallet. If you are looking for a smaller price as a gift, then the AirPods and new Apple Pencil 2 are the ideal choice. The new Pencil is a great combination with the new iPad Pro - in fact it is the only Pencil you can use with this model! But it is so much better than Pencil 1 as it magnetically connects to the side of the iPad, where it stays tightly linked and charges! The AirPods is one of those Apple gems which still impresses me long after their launch. The AirPods are small, fit neatly into the small jeans pocket and are so much better to use than the cabled headphones or even traditional Bluetooth headsets. Plus the battery length is incredible- I mostly forget to charge them at all, and only do this every few weeks. I bought a new MacBook Air recently and this Mac would go back in as my recommended Mac laptop for many people. The balance of new case, the higher speed and the new retina-display all add up to a neat package. It sits above the MacBook in terms of screen size and speed and below the MacBook Pro for sheer power, but this is a sweet spot for most users and I can see it staying as Apple’s best selling laptop. Overall there are some nice pieces out there for Christmas purchases- these are just a few of my own favourites! Today Apple launched the new iPhone Xs, Xs Max and Xr phones. These replace the iPhone X and offer a wider range of sizes and options. The iPhone Xs and Xs Max are the new top of the range phones. They come with a new faster A12 Bionic processor, a better camera offering 12MP with zoom lens, and a Portrait mode which allows the user to choose and vary the level of blur for the background of images. The new iPhone Xs range comes in two sizes- 5.8" Xs version and the 6.5" Xs Max. The latter is the biggest screen ever produced on an iPhone. Aside from the top of the range Xs, Apple also announced an Xr range, which comes with a cheaper price point. It has the same chip as the Xs but only a single lens camera. The other major news at the event was the new Apple Watch Series 4, which in the US comes with an ECG Heart monitor that can detect heart defects such as low and irregular heart rates. For an Irish audience., the biggest disappointment is the absence of Ireland in the launch dates for the Cellular version. This also happened last year and means that Ireland remains excluded from the mobile-linked version of the Watch. The Series 4 Watch comes with a larger screen which gives over 30% more screen space, allowing for better Watch faces and complications. It has an improved Digital Crown with Haptic feedback, new microphone and speaker, and comes with a new S4 chip, giving twice the speed of last years S3. These new models will be the successors to the iPhone 7 and the iPhone 7 Plus. The main changes are the better camera, faster A11 chip and more storage included, starting at 64GB. The iPhone 8 can also be charged wirelessly- where you can place the phone on a mat-type device and it charges through the back of the phone. The new retina displays are "true-tone", which means they adjust depending on the light, which should help to make them easier to read in the sun! Other changes include the new glass-back design and a new gold colour. Overall the iPhone 8 is a steady, yearly improvement over the 7, if not revolutionary. The main selling points are the better camera and the extra speed. The very revolutionary iPhone X (“ten”) comes on the 10th anniversary of the original iPhone. This is a very different design, with the screen almost covering the entire front surface of the phone. There is no home button either, and the device unlocks using the new Face ID, which will scan the contours of your face when you look at it. According to Apple, Touch ID (fingerprint) has unique security of 1 in 50,000 people, whereas Face ID is at 1 in 1,000,000. Face ID projects 30,000 dots onto the surface of your face to ensure a high level of security and accuracy. The facial recognition technology also extends to emojis! You can make a facial expression and turn it into your own emoji, called an animoji! The new OLED screen is what Apple calls Super Retina, with better colours and more pixels per inch, making it the highest resolution screen Apple have produced. The camera is also improved, with portrait mode photos available on both the front and rear cameras.The camera is also Augmented-Reality-ready, something Apple has bene pushing for new games and apps. Overall a very new look for an iPhone and, combined with Face ID, it has many cutting-edge technologies packed in here. The big change to this year’s Apple Watch Series 3 is a version which comes with a mobile/cellular chip, meaning you could take a Watch out and still get calls, texts, use Maps and Siri. Apple announced that you can use Apple Music on the cellular Watch, so combined with Bluetooth headphones, the Watch will be a streaming music device. Great for people who like to go for long walks, run or cycle. No need to take your iPhone out to play music! Only catch- the cellular version will not launch in Ireland just yet. Apple are likely to have to agree deals with local mobile companies, so expect this to arrive in the next few months. Adding your Watch to your data package is likely to add around €10 / $10 extra per month to your bill. With what may seem to be a minor change to the Apple TV lineup, Apple announced the new Apple TV 4K, which can play high quality 4K movies. If you have a 4K TV this is big news as the quality will be quite dramatic. But you will need a 4K TV to get the most out of this. Apple have got the major studios on board and they will be selling and renting 4K movies. Amazon Prime is also coming to the Apple TV in the next few weeks. Both are free downloads- please backup your data first! I have been using the new Apple AirPods for a while now and they are one of those Apple inventions which moves things forward. They have many pros and cons, but from the start you can't fail to be impressed by their design. From the easy method of pairing them to your iPhone, by simply opening the lid, to the simplicity and lack of buttons, the AirPods are beautiful to look at and have a quality feel. Firstly, what works well. The design of the AirPods is amazing. The small case, which reminds us of a dental floss or a tac-tic box, is a small battery-charging device which makes a huge difference to the Bluetooth experience. In the past, when I used Beats Bluetooth headphones, they would run out of battery or I would realise that I had forgetten to charge them in advance. With the Apple AirPods case, once the buds are placed back in, they are changed from the cases's internal battery. So far since getting my AirPods, I have never run out of battery. Being free of wires is also great as I always found cables hanging from my ears to be uncomfortable and awkward. When in place in my ears, the AirPods are comfortable. They are not as heavy as they might seem, and a good balance between being light enough to wear on long walks and heavy enough to stay in place. They are smooth and comfortable and the sound quality is good (although I'm not sure I would be the best expert in assessing sound quality). One concern is the fit. I had issues with Apple headsets in the past, as the wired versions which came with new iPhones and iPods never fitted my ears. The AirPods are different and do fit well. But I have dropped one of them on two occasions. I do feel a little nervous walking near drains and grates on the road or when walking over a bridge, as a dropped AirPod may not be retrievable! In terms of the drawbacks, the functionality of the AirPods is limited. They play audio from my Watch or iPhone and they do this very well. However I haven't used Siri that often and it is disappointing that I must to use Siri to play/pause tracks. I would prefer a few shortcuts, such as the ability to use taps to control my music.Yes I can ask Siri to "play" or "pause", but speaking instructions out loud is not always convenient. Siri does work well- it recognises my instructions and is an impressive technology. But I still don't like having to talk and speak in public when a series of taps would be far more subtle. Maybe Apple will expand the use of taps, such as a double-tap on the left AirPod to play/pause and a double tap on the right AirPod for Siri? Changing the volume level is also messy, and it is far simpler to take the iPhone out of my pocket and use the volume buttons on the side. In terms of the taps, I almost always mis-tap when walking, and have to give it a second go until Siri kicks in. But overall the AirPods are one of the most impressive products from Apple in years. They are a classy product, simple to use and good value for Bluetooth headphones. They feel good, sound good and with some limitations, are a pleasure to use. Being able to load music on my Apple Watch and then walk with just the Watch and AirPods is a very stripped down way to use technology and I feel a sign of the future from Apple. Photos: The iPhone 7 comes with a new A10 chip for faster speed and graphics but the big news is the new internal cameras. The standard 7 comes with a new camera capable of capturing a wider range of colours, plus a new LED flash, meaning that low-light photos are much clearer than in previous iPhones. The new 7 Plus (big iPhone) comes with a zoom lens. Although a small zoom amount compared to pro-cameras (2x optical or 10x digital), it is the first iPhone to come with any real zoom feature. Even the front camera, used mostly for FaceTime (and selfies!! ), goes up to a 7 megapixel resolution (previously 5). Here Comes the Autumn... What's Next for Apple? The new iPhone will arrive in September and will come with a few usual changes. Thinner design, new Ax chip inside which will be faster than the 6S, better graphics, improved camera. There has been a bit of talk about a new dual lens camera, and this certainly fits into the usual iterative updates. One question- will Apple continue to update the iPhone SE separately to the main iPhone lines? Looks likely this year as the SE is too new for a refresh in September. The big question is the headphone socket and whether Apple will go for a lightening connection for wired EarBuds or opt for some sort of wireless option? My own view here is that this will come down to usability. Not only does the ease of connection matter, in other words how the Bluetooth or other wireless technology works, but also the battery life of any wireless EarBuds. I suspect we will see lightening EarBuds shipping as the standard and possibly new wireless versions as an optional extra. But let's hope that if Apple do go for wirelessly versions, they have got something better than the current Bluetooth technology, which is at best fiddly and normally frustrating to use. It is possible that we will see changes to the iPad, especially as we approach Christmas. The iPad would be a good seller during the holidays and the iPad Pro (12" model) could see changes so it has the newer TrueTone display. The smaller 9" iPad Pro is less likely to change as it is less than a year old. 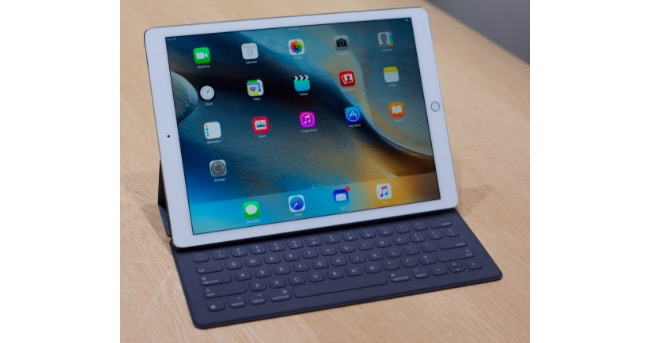 It is also possible that Apple will leave the iPad out, given that the Pro has been changed in the last 12 months, and make any changes in the new year. We will definitely see three updated operating systems- the new macOS Sierra to replace OS X El Capitan, the next version of the iPhone, iPad and iPod touch operating system, iOS 10 and watchOS 3.0. This was set out in June at WWDC and it is likely to ship (for free) in October. It also seems to be time for new Apple Watch models. Apple launched the first Watch almost 18 months ago. As we approach the Christmas buying season it seems logical that there will be new Watch models; I have always maintained that the Watch is the new iPod, for music and fitness. Maybe it is also time to streamline the range from three to two families of Watch? - Greg Joswiak introduced the new low end 4" iPhone- the iPhone SE. It comes with the A9 chip, 12MP camera, ApplePay, better battery life, Live Photos. It is twice as fast as the 5s. The new iPhones come in the same shape and form as the previous iPhone 6 and 6 Plus. These models are aimed at people who are still using an iPhone 5s or earlier. Most users sign up for a two year contract and this is why iPhone 5s (or earlier) users are the target as they are now coming off those contracts. iPhone 6 users will only find marginal differences to lure them away from their current phone. - new 3D Touch technology which means if you press slightly harder on the screen it will bring up a pop-up menu with some different options to choose from. This is a great way to access features inside an application without having to tap through a number of screens. - new colour- rose gold! - The storage options remain the same – 16, 64 and 128 GB. very few people should consider a 16 GB model as this is too small for most users. - the new iPhones are available to order in the US and UK, but not in Ireland for another few weeks. 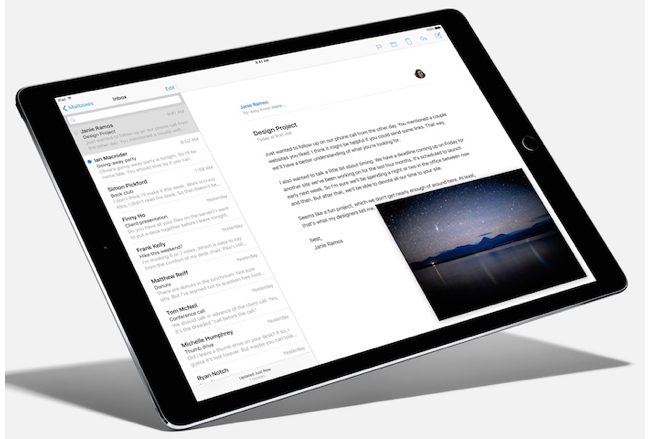 The iPad Pro will be available later this year, starting in the US in November. This is a new model of iPad which is placed at the top end of the range, and will be useful for certain people who need larger screen space. The new screen is almost 13” and gives almost the same space as two iPad Airs. This is unlikely to become the mainstream model of iPad, but instead a device which will be used by professionals who need multiple applications and lots of space. The iPad Pro can also be used with a new stylus (Apple Pencil) which will be helpful to designers and artists. The other accessory introduced is a keyboard which is built into a screen cover. This will make the iPad Pro a strong alternative to a laptop. Apple seem to be aiming this iPad at the enterprise market. The iPad Air and iPad mini models are still available and remain unchanged. 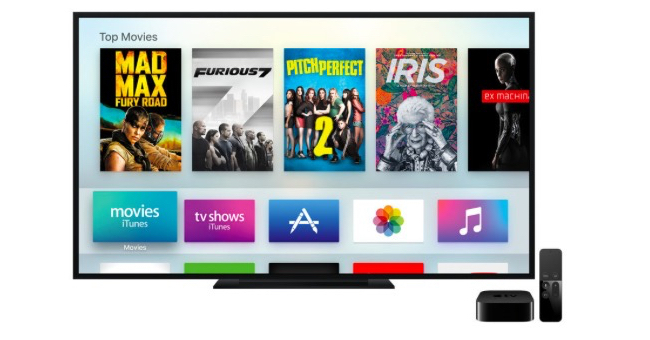 The new Apple TV opens up a whole range of new features, most notably apps and games. There will be an App Store available on the Apple TV where developers can sell a range of new apps. The look and design of the Apple TV interface has also been updated. This positions the Apple TV as a living room multimedia device and not just for TV/Films and Music. The new remote control also acts as a game console controller. Siri (voice-recognition) is built-in so you can ask your Apple TV questions, such as for movie suggestions, information about who stars in the film you’re watching or command it to open an app for you. The new Apple TV will go on sale later this year.